Your webstore includes a built-in shopping cart and credit card processing engine all managed from your web browser. A Sophio webstore can be installed on your web server or ours. Sophio B2C is a dynamic browser-based webstore development and management system that allows you to create and administer multiple online stores utilizing multiple catalogs from anywhere you have access to the Internet. Sophio was built from the ground up using Microsoft software development platforms such as ASP, ASP.NET, Visual C++, and Visual Foxpro. The Sophio B2BC module now includes all features from both our B2B and B2C module. Security & Simple Customer Management - Customers are not required to register or log into the site. This makes it less intrusive for an anonymous consumer to browse and shop at your site. The consumers contact information and billing information will be saved in a database and tracked with a cookie. This cookie will make it easy for them to checkout when returning to place subsequent orders. Furthermore, consumers without cookies enter their email address and password to retrieve their billing and or shipping information. The site can be configured to login, so both modes are supported. The choice is yours. Tax - If your customer resides in your company's home state, we will charge sales tax by default. This can be turned off, but by default is turned on. b2b customers must register and give you their tax id number for tax to NOT be charged. Shipping - When selling products to consumers we will use the standard retail freight prices from UPS, FedEx, Airborne Express and the United States Postal Service. Sophio dynamically updates the shipping cost based on the weight and destination zip code at checkout. In addition, you may increase or decrease the rates based on a percentage markup or markdown. In addition, if your Supplier offers real time freight quotes, we will first check with them (electronically) to be sure you do not under or over charge for shipping. Simple Administration via web browser - No software to install, no manuals to read... Just point and click. Our Knowledgebase & Technical Support area has all the answers you need. Find Sophio on Facebook & Twitter. 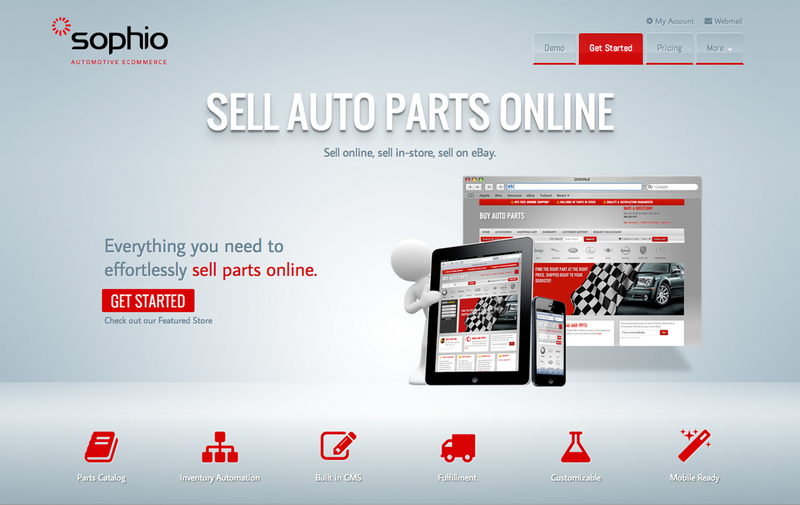 We build Automotive eCommerce sites. Do you have a tutorial or documentation? How do I review my Payment History? How do I upload my own products to my Sophio webstore? Can I use multiple catalogs in the same Sophio webstore? Can you help us get our fitment data on Amazon? Copyright © 2019 Sophio Software, Inc. All Rights Reserved.